Nicotinell Chewing Gum 4mg Liquorice - 96 Pieces. Nicotinell Nicotine 1mg Mint Compressed Lozenges (144). Condition is New. Dispatched with Royal Mail 2nd Class. Nicotinell fruit 2mg. 3 boxes of 96=288. Nicotinell Mint 1mg Compressed Lozenge 144 Lozenges stop smoking. Condition is New. Dispatched with Royal Mail 2nd Class. Item is donated. Price reflects this issue. We do not regulate those prices. Long Expiry date, longer than 6months. You can receive old or new type of the box. This will be compleatly random. You will receive only 1 box. Nicotinell® lozenges help you to stop smoking discreetly relieves your cravings with a fresh, minty taste. Nicotinell Nicotine Patch, 14mg - Step 2. Condition is New. This is enough for 6 weeks. You are viewing 2 packs of Nicotinell Fruit gum 2mg with 204 pieces in each. These are dated 2020. These will be sent by recorded post only. Payment is by Paypal only. Thanks for looking! 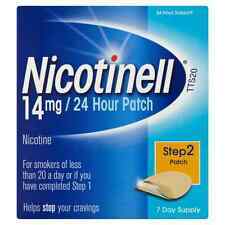 Nicotinell Nicotine Patch TTS10, 7mg - Step 3. Condition is New. You are viewing 2 packs of Nicotinell Sugar Free Mint Extra Strength compressed Lozenges 2mg with 204 pieces in each, as pictured. These are dated 2021. These will be sent by recorded post only. Payment is by Paypal only. Thanks for looking! Nicotinell fruit 2mg GUM. 2 boxes of 96. one box 09/19. the other 01/20. Nicotinell Mint Medicated Chewing Gum 2mg, 204 Pieces. Sugar Free. Two boxes . Brand new and sealed and expiry date of August 2020.. Dispatched with Recorded delivery. Nicotinell Stop Smoking Aid Nicotine Gum, 2 mg, Fruit, 204 Pieces 9/2020. Condition is New. Dispatched with Royal Mail 2nd Class. Mint 1mg Compressed Lozenge Regular Strength. Nicotinell Mint 2mg Compressed Lozenge - 204 Lozenges. Extra Strength Lozenge. 2 x Nicotinell Mint 1mg Compressed Lozenge - 2 x 204 = 408 lozenges exp 05/2020. Nicotinell Compressed Nicotine 1mg Mint Regular Strength Lozenges 204 pcs. Condition is New. Dispatched with Royal Mail Signed For® 2nd Class. You are viewing 2 packs of Nicotinell Mint gum 2mg with 204 pieces in each. These are dated 2020. These will be sent by recorded post only. Payment is by Paypal only. Thanks for looking! Nicotinell patches step 1 2 boxes . Condition is New. Dispatched with Royal Mail 1st Class. Nicotinell Mint 1mg Compressed Lozenge 204 Lozenges. Condition is New. Dispatched with Royal Mail Signed For® 2nd Class. It contains nicotine resin in a chewing gum formulation. When the gum is chewed nicotine is released slowly and absorbed through the lining of the mouth. Warning:For adults and adolescents over 12 years of age. Nicotinell Mint 1mg Compressed Lozenge 204 nicotine regular strenght lozenge. Condition is New. Dispatched with Royal Mail Signed For® 2nd Class. Nicotinell TTS30 Patch (Step 1). Nicotinell Patch is an aid to combat the withdrawal symptoms caused by giving up smoking. Nicotinell patch contains nicotine. Stop smoking aid. Always read the label. Nicotinell Lozenges 2mg 216 Sugar Free Mint Lozenges. Brand New. Expire May 2019 Any questions please ask. Nicotinell Mint Lozenge 1Mg 144'S. The lozenge provides on-the-go relief when the urge to smoke strikes and dissolves in the mouth to release a dose of nicotine to help satisfy that urge. It is a convenient, discreet, and alternative option to our chewing gum and has a fresh, minty taste. NICOTINELL FRUIT GUM 94 PIECES. They can also be used to satisfy cravings in situations where you are unable or unwilling to smoke, such as in confined spaces or in the presence of children. Alternative flavours available are mint, icemint and liquorice. 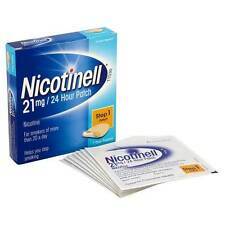 Nicotinell Patch is an aid to combat the withdrawal symptoms caused by giving up smoking. Nicotinell patch contains nicotine. Stop smoking aid. Always read the label. Requires willpower. Nicotinell TTS10 Patch (Step 3). Long Expiry. No warranty. Price reflects this issue. We do not regulate those prices.